Menai Oysters operates three different types of purification systems. 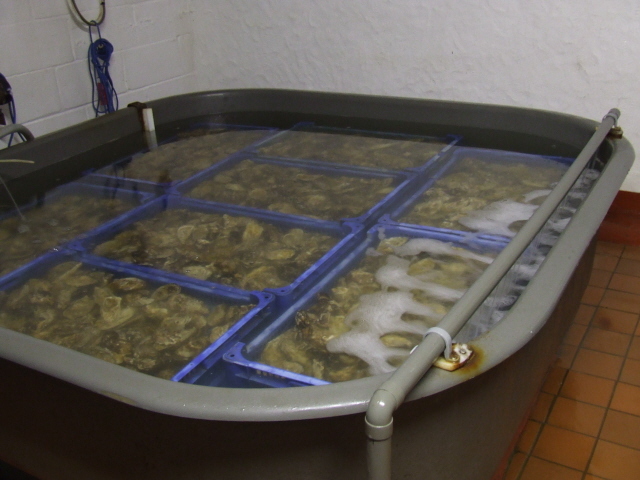 The first system is a simple tank system that is used to purify the oysters. The second system is a vertical stack system that can be used to purify both oysters and mussels. 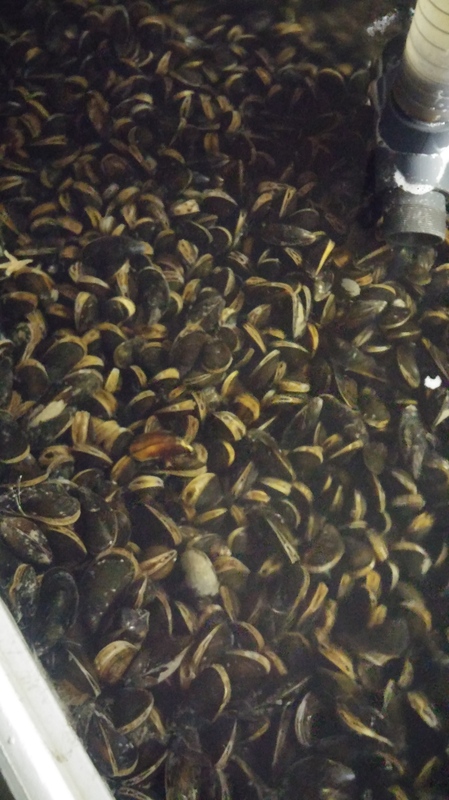 The third is a compact bulk bin system for the purification of mussels. All systems are based on Seafish standard purification systems for shellfish. Menai Oysters is able to manufacture any of these systems for use in your own shellfish business. 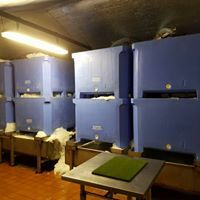 They can also be used to store shellfish to maintain freshness and systems such as the vertical stack system can be constructed to any size to suit your installation requirements. Please Contact Us to discuss your requirements. Please note that all systems have to be tested prior to use in your premises and this applies to all installed systems whether purchased or constructed yourself. Contact your local EHO for more information. As well as constructing the systems we can also provide consultancy on how to operate them. There is a requirement today to produce not only records of purification, but also HACCP systems and biosecurity plans. We can assess your setups and produce tailor made plans for your operations. As the name implies this is is just a tank in which trays of oysters are placed and are fully immersed in water. The water is recirculated through the tank passing through the UV light and cooler (optional). Once purified the water is drained down and the shellfish removed. 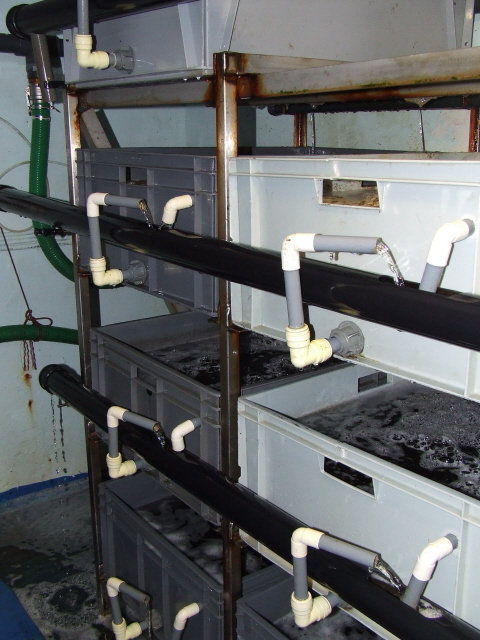 This system can be used for oysters and is scalable to your requirements. This system works well in situations where a small floor space but larger quantity of shellfish are required. Instead of a large tank into which the shellfish are placed in ventilated trays, solid trays are stacked above a sump tank. Each tray is supplied with its own post UV water and the overflow from the tank is drained into the sump. This system uses two pallet boxes to purify 600kg of mussels per cycle. It is compact in that the sump and storage reservoir are incorporated into a stainless steel tank below the pallet boxes, rather than requiring two separate tanks. This means a small space can be geared up to handle pallet quantity mussels using a stacker or forklift. We have opted for a stainless steel tank as it is more resistant to damage from impact from forklift truck. The occupied floor area is 2.5 x 1.5m. The tank is also designed to be very easy to clean. We also have our pumps, lights and coolers situated remotely from the tank. This not only allows for more efficient cooling but also reduces any possibility of water coming into contact with the electrical equipment. We would recommend this situation and as such all plumbing would be tailored to your particular situation.